The ToW Club is a group of individuals who have banded together for the common purpose of gaming with other like minded gamers. The ToW Club is a 'private' club and one cannot join by application but must be 'invited' into the organization. The goal of ToW Club members is to the best gamer one can be regardless of game played. Pro-Gaming level is the objective. Of course this does not mean all ToW Club Members are Pro's.. but they do aspire to be. Club Members are expected to 'raise the bar' in all aspects of gaming and especially in behavior and how they represent the Club. We are an Officers and Gentleman's Club and expect the level of behavior to reflect same. 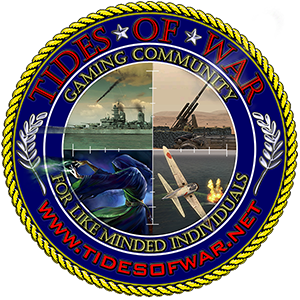 ToW Club members own the Club and www.tidesofwar.net and all copyrights, branding and trademarks. Club member donations fund most all expenses with some funds coming from site donations. The ToW Club is rich with resources and is proud to share those resources with the general gaming public. For further information about the ToW Club, please ask a Club Member via one of our Social Media's.